Coming off the whole finger fiasco in California, Wendy's will be offering free Junior Frostys this weekend (May 13-15) at all US locations. No purchase is required. Wendy's held this promotion previously in the San Francisco area to help lure customers back after the finger incident. 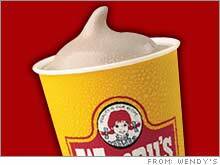 Wendy's estimates it will give away 14 million Frostys.